The upcoming Apple's 10th anniversary new iPhone, called iPhone 8 (Plus), will be released in September, 2017, and it amazes the iPhone buffs with a 5.5-inch & 5.8-inch OLED display iPhone 8/Plus video converter hunt for changing various video formats into the new iPhone 8 playable ones. A video transcoder for iPhone 8 is absolutely necessary for every iPhone 8/Plus users to watch movies or videos unlimitedly. Many common video formats like WMV, MKV, MTS, AVI, FLV, etc cannot be played on iPhone 8 directly. But with an appropriate video to iPhone 8 (Plus) converter in hand, the video format incompatibility issue with the new iPhone 8 will be solved. World's First Intel QSV Video Converter to Convert Video to iPhone 8/Plus No.1 Fast! Do you want to a good iPhone 8 video transcoder working properly for you? 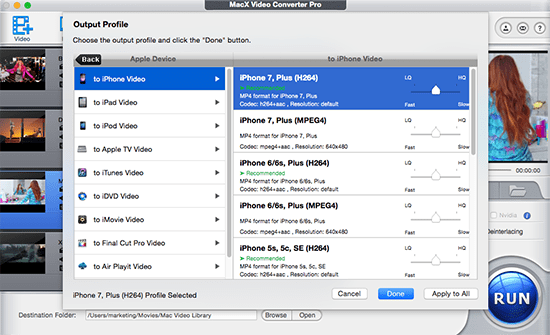 Never mind, MacX Video Converter Pro is all that you need. Constantly updated for the latest mobile devices, the Mac video converter for iPhone convert any video (SD & HD) to iPhone 8/Plus, iPhone X/8/7s/7/6s/6/SE/5s, etc and iPad Pro, iPad Air 2, iPad Mini 4 with Retina, Samsung Galaxy S8 edge+/Note 8, HTC, Sony, etc. with fastest speed (Intel QSV supports). Built-in 370 video and audio codecs, this award-winning program is able to convert MKV, M2TS, MTS, AVCHD, MP4, AVI, FLV, WMV to iPhone 8 supported formats like MP4, MOV, M4V, etc within a short time. After free download this video to iPhone 8 converter and fire it up. click "Add Files" to load the video Choose the output format as you like. To convert video to iPhone 8 or iPhone 8 Plus, simply hit Apple Device -> to iPhone Video and choose iPhone 8/7 as the output format etc. Click "Browse" button in output setting area to save your converted movie. Step 4: Start Converting Video to iPhone 8/Plus. "RUN" button to start iPhone 8 video conversion. After a few seconds, you can import video to iPhone 8 for playing smoothly. Besides common SD and HD video conversion for the 2014 new iPhone 8, MacX Video Converter Pro also performs as a fast YouTube channel downloader for you to download YouTube MP4 video to iPhone 8/6 Plus, as well as download and convert FLV, AVI, MKV YouTube video to iPhone 8/6 Plus, iPad ,iPod, Android with up to 98% quality reserved in a flash. After converting video to iPhone 8/Plus/7/Plus supported MP4 MOV or M4V (H2.64) format, you can finally transfer video to iPhone 8/Plus/7 without iTunes sync using MacX MediaTrans, the fastest and easiest file transfer software to copy video from Mac to iPhone 8/7/Plus, iPads, iPods just drap-drop. This top iTunes alternative also enables you to transfer music from iPhone to Mac, photos, ringtones, iBooks, iTunes U, Podcast sync between iPhone iPad and Mac computer in seconds only. Here's a list of top freeware for you to convert among HD and SD videos on Mac OS (macOS High Sierra included) for free, like MKV to AVI, AVI to MP4, etc and convert video to iPhone (iPhone 7), iPad (iPad Pro), iPod, Android. Do not miss this to convert video free with best free video converter for Mac. Do you want to know the video and audio formats compatible with iPhone 8? Well, this article will tell you the video and audio formats iPhone 8 supports so that you can have a deeper understanding about your iPhone. Follow me to learn how to download movies to iPhone 7/6S/6S Plus/SE/6/6 Plus/5S/5C/5/4S with full length and no costs. And the steps to download free HD movies to iPhone will be included, as well. MacX Video Converter Pro is an all-in-one video to iPhone 8 converter to convert any video to iPhone 8/7/Plus with top quality and fast speed. This feature-rich video converter can also help you download HD or SD videos from YouTube, Vevo and more 300+ sites.